Right-click a track channel strip and choose Insert Audio Track or Insert MIDI Track on the pop-up menu. Right-click a bus channel strip and choose Insert Stereo Bus or Insert Surround Bus on the pop-up menu. Right-click the track or bus and choose Delete Track or Delete Bus on the pop-up menu. Double-click the Name control at the bottom of the channel strip and type a new name. To move a strip, hold down the ALT key, then click an empty area in the strip and drag the strip to the desired location. To select the next or previous channel strip, press the LEFT ARROW or RIGHT ARROW key. To jump to the first or last channel strip in the current pane (Track, Bus or Hardware Output pane), press the PAGE UP and PAGE DOWN keys. To scroll to the next or previous channel strip, click the scroll arrow buttons in the scrollbar. Click the center of a knob and drag up or down. Point to a control and scroll the mouse wheel. Double-click the center of a knob and type the desired value. Double-click the value display below a volume fader and type the desired value. Double-click the bottom of a knob to reset it to its snap-to position. To adjust the same control in all channel strips, hold down the CTRL key and adjust a control. To adjust the same control in all selected channel strips of the same type, hold down CTRL+SHIFT and adjust a control in any selected channel strip. Tip: To adjust faders and knobs with greater precision, hold down the SHIFT key while adjusting the control. Faders and knobs have snap-to positions. To set the snap-to position, move a control to the desired snap-to position, right-click the control, and choose Value > Set Snap To = Current. Click the channel strip’s Write Automation button. To disable automation writing for the channel strip, click the Write Automation button again. Tip: To disable automation writing for all write-enabled channel strips, click the Clear all automation write enables button in the Control Bar’s Mix module. For details, see Mix module. Right-click the control and choose Automation Write Enable on the pop-up menu. To disable automation writing for the control, choose Automation Write Enable on the menu again. Read Automation and Write Automation buttons are fully colored when they affect the entire channel strip. If only a subset of the channel strip’s controls are affected, the Read Automation button and Write Automation buttons are only partially colored. Figure 676. The Read Automation and Write Automation buttons indicate if the entire channel strip is affected, or only a subset of its controls. Click the Insert FX button in the FX Rack module and choose a plug-in on the pop-up menu. 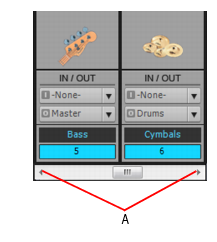 Right-click the FX Rack and choose a plug-in on the pop-up menu. Go to Edit > Preferences > MIDI - Control Surfaces. Select your control surface in the Connected Controllers/Surfaces list. Under WAI Display, select the Console View check box. The Console view shows a color-coded bar at the bottom of any channel strips that are controlled by your control surface. If you are using multiple control surfaces, you can assign a custom color to each control surface. For details, see The WAI display. Click the Modules menu in the Console view and choose the desired module. Figure 677. Console view Modules menu. Click the Strips menu in the Console view and choose Track Manager to open the Track Manager dialog box. Select the channel strips you want to see, then click OK.
Click the Strips menu in the Console view and choose the desired channel strip type. Figure 678. Console view Strips menu. To set all channel strips to wide mode, click the Strips menu and choose Widen All Strips. To set all channel strips to narrow mode, click the Strips menu and choose Narrow All Strips. To toggle an individual channel strip between wide and narrow mode, right-click the channel strip and choose Narrow Strip on the pop-up menu. Click the Options menu, point to Meters, then set the desired options. Right-click the meter and choose a range. To reset a single clip indicator, click the clip indicator. To reset all clip indicators, click the Options menu, point to Meters and choose Reset All Meters. Drag the Console view to the MultiDock. Click the Docking Options button and choose Dock in MultiDock. For more information about the MultiDock, see MultiDock. Click the Docking Options button and choose Undock. Right-click the Console view tab and choose Undock. Clear the Keep track/console visibility states in sync check box and click OK.
Right-click the control you want to assign to a group, point to Group, then select the desired group on the submenu. Repeat the steps for each control you want to assign to the same group. You can adjust all grouped controls by adjusting any group member. To adjust a grouped control without affecting any other controls in the same group, hold down the CTRL key while you adjust the control. In the Hardware Output channel strip whose faders you want to link, adjust the volume of each fader to the appropriate level. Click the Link button .